This pewter finish Merry Christmas From Heaven ornament and poem card is a thoughtful and loving gift for anyone who has lost a loved one. John Mooney wrote "Merry Christmas From Heaven" in 1989, after the death of his mother. His intention was to present it to his family that year, understanding the holiday season was going to be harder on all of them without her. Memorial Christmas ornaments are now available to capture this same feeling. Express your feelings by writing a message up to three lines to create a personalized Christmas ornament that will forever be unforgettable. This beautifully customized Christmas ornament also includes a bookmark that features the entire "Merry Christmas From Heaven"poem. The words speak to our hearts reminding us that those we love in Heaven remain a part of our lives. Their love is forever a part of us and although we feel loss we have reason to rejoice. They are home. They are "spending Christmas with Jesus this year." 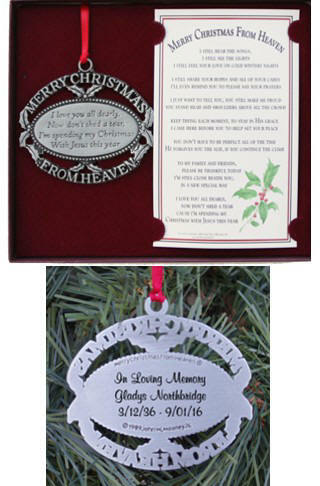 The pricing for our keepsake ornaments include the ornament, poem card, and gift box at no additional charge.